← When art meets free play, who wins? Tanya spent two months in Europe earlier this year on a Churchill Fellowship study tour, and visited dozens of play facilities in Copenhagen, including every one of the city’s play yards. (‘Play yard’ is her term to describe neighbourhood staffed play facilities that are aimed at children from 0 to 16, and that include both indoor and outdoor space). Her report is one of the most useful of its kind that I have ever read. It is full of insights into the design, management and ethos of the settings. It is also hard-hitting, making some powerful points about the nature of childhood in Australia and the urgent need for better places for children to play. All in just over 40 pages, plus an appendix with superbly designed spreads giving site-by-site descriptions. There is even a site map for the Copenhagen projects. 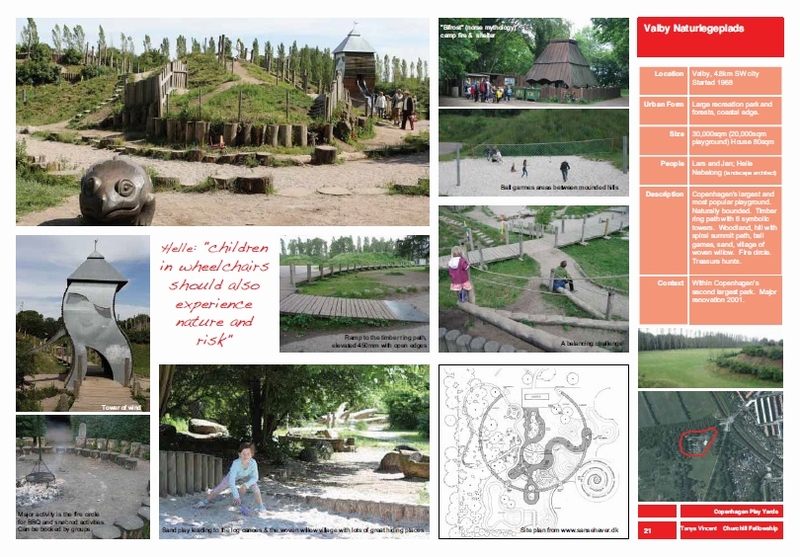 As well as the conventional play yards, Tanya reports on some other play sites, including several ‘construction playgrounds’ (Denmark’s version of the staffed adventure playground), a ‘traffic playground’ in central Copenhagen, and the regional nature park at Valbyparken – one of my personal favourites, designed by Helle Nebelong. She has also thrown in for good measure some sites in Sweden and London (including the Diana Memorial playground, and Glamis Adventure Playground, where we met). 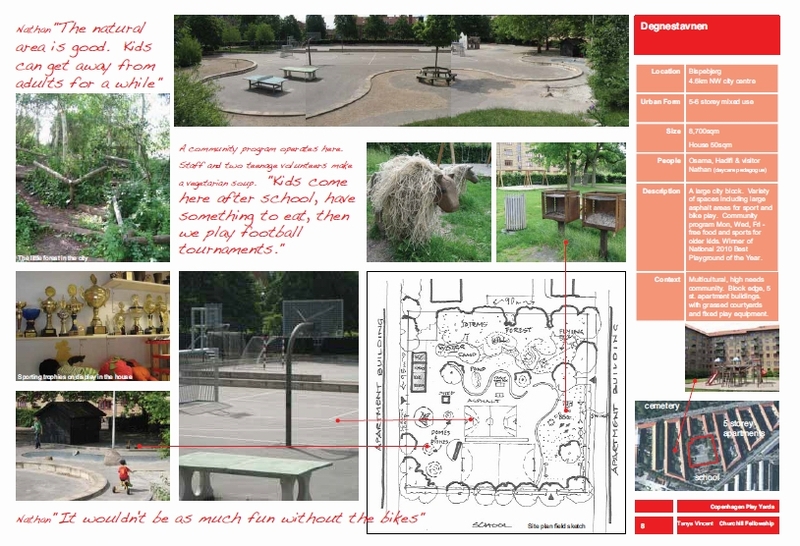 The report includes a helpful discussion of Victoria’s five staffed adventure playgrounds to give some Australian context. Indeed Tanya recognises the need to take into account Danish culture and policies (this is after all a country with a generous and well-funded welfare state). 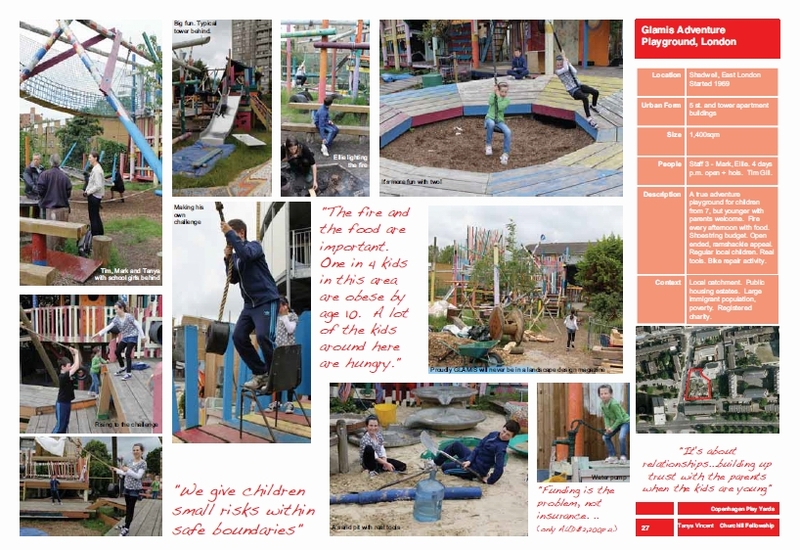 The play yard concept needs a powerful constituency of interest convinced of the benefits and with the motivation to make improvements for urban families. Establish and evaluate a pilot project in Sydney to test and adapt the model to the Australian context. Government agencies should clarify that a middle years child (at the discretion of the parent) can be in public places such as parks, libraries, streets without being in the ‘duty of care’ of an adult. Government agencies need to publicise that good parenting includes giving children progressively more independence as they move through the middle years. Tertiary educationalists should explore the concept of ‘pedagogue’ training as a bridging discipline between education, early childhood, social work and community care. Tanya is presenting on her trip in Sydney on 8 Nov. Sadly, even though I will be in Australia, I cannot make it, as I’ll be on the other side of the country – but if you are anywhere nearby I am sure it will be terrific. I know the value of overseas trips, from my own experience of visiting Copenhagen, and other cities like Freiburg, Stockholm and Malmö. In my view, Tanya’s report will be immensely helpful in generating ideas about meeting the needs of urban children and families, in Australia and beyond. What do you think: how much can we learn from the Danes, and what messages do you take from Tanya? 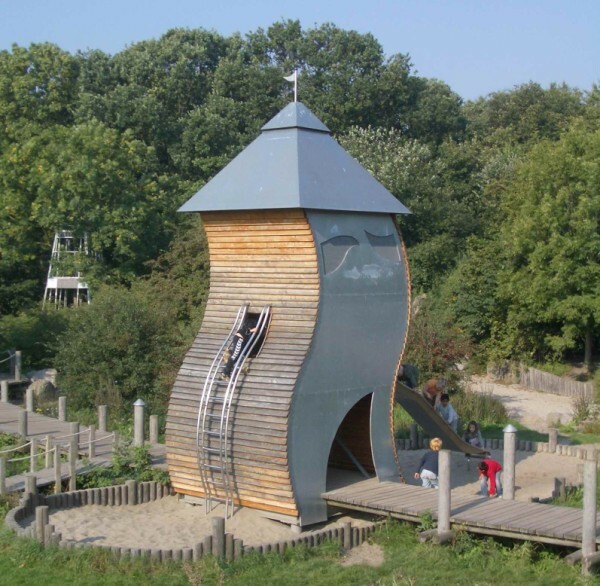 This entry was posted in Outdoor play, Play spaces, Public policy and tagged Adventure playground, Australia, copenhagen, Denmark, design, play space, policy. Bookmark the permalink. It’s a super report! Really detailed and well-organised. Thanks for letting the world know! Juliet – I know – and thanks for dropping by! Thank you so much for sharing Tanya’s report it will help me to get my message across to the people in power in Bilbao . It explains the concept very well .Also thank you Tim for your inspiration and tireless pursuit for change or returning to the way we once were. Great post, Tim, and a thorough report. I particularly like the site-by-site appendix and the site map. This makes ME want to play there. Hi Tim. Many thanks. This will help with some discussions and presentations coming up. Regards Ron. I just did a similar trip (on a smaller scale) as Tanya. Many thanks to her for this and to you for sharing!